Ok! I’m on my way. 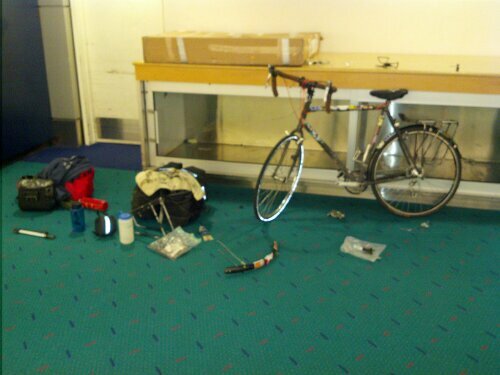 Got the bike to Portland ok and assembled in baggage claim with minimum swearing, which is pretty good considering I left for the airport at 5am after getting three hours of sleep. It should be noted that southwest changed their bike policy to charging $75 instead of 50 to fly with a bike, leaving frontier as the lone airline that doesn’t rip you off when traveling with bikes. 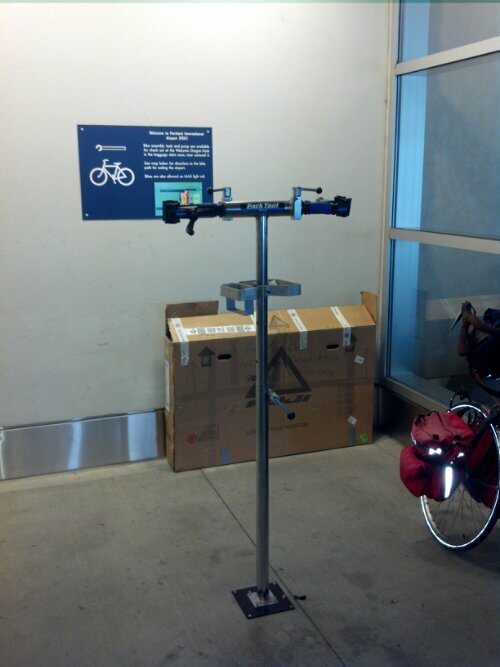 Also of note is that Portland airport has a bike assembly station (a bike stand) next to the baggage claim! Unfortunately, I didn’t know until I already had my stuff scattered all over the carpet. 3. On said bike path, you encounter a squadron of four people rollerblading while pushing baby carriages. Right now I’m getting brunch and pie! Next I’m gonna make my way to the Columbia River gorge scenic highway, where hopefully I’ll find a place to take a nap!